Also, we have a page on the High Beach Church. 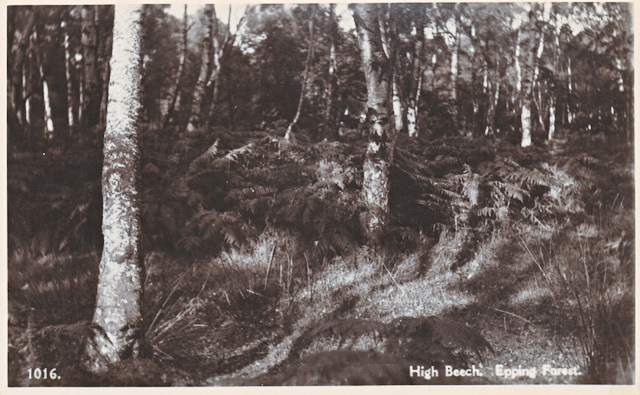 Sometimes spelt as High Beach and sometimes as High Beech. 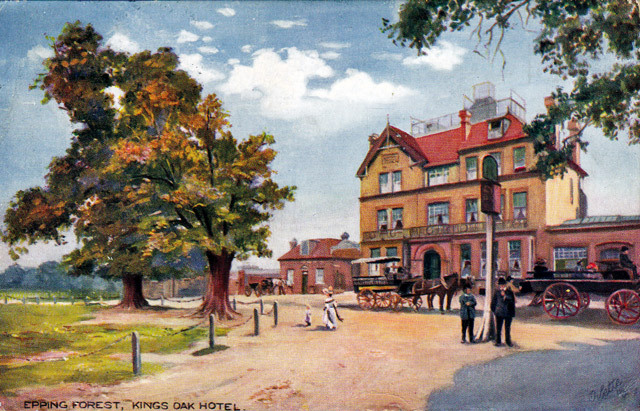 Printed on the back of the card: King's Oak Hotel. 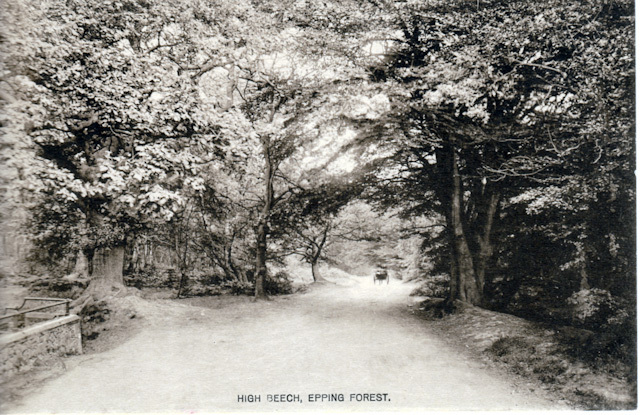 The finest part of Epping Forest is High Beech, where are found the famous Epping Beeches. Here Tennyson once lived and wrote several of his works. The hotel is one of the largest in the forest and, being situated so happily, is a favourite centre for the many trippers who throng the forest on Saturdays and Sundays. The family firm belonging to the Websters of Ashleigh was involved in the production of Tuck's postcards. 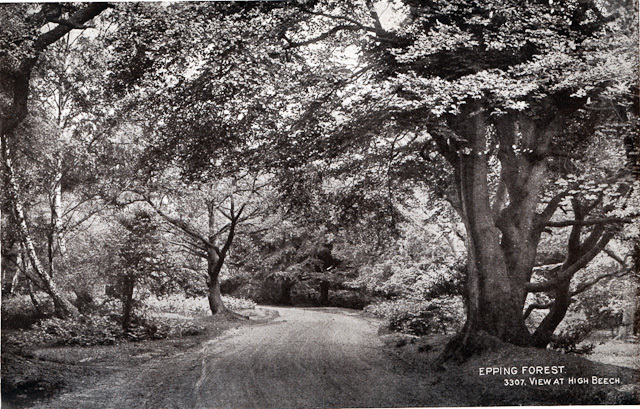 A view of a horse and cart travelling through Epping Forest, Essex at High Beach. Epping Forest; High Beach. King Harold's Oak & Queen Victoria's Oak Planted 1882. An unused F Frith & Co Postcard, about 1910. No information has been found about King Harold's Oak, presumably the stump on the left. The King's Oak Hotel may be named after this tree. A Scarlet Oak (Quercus coccinea) was planted in the same area to commemorate the visit of Queen Victoria to Chingford and High Beech (High Beach) on 6 May 1882. 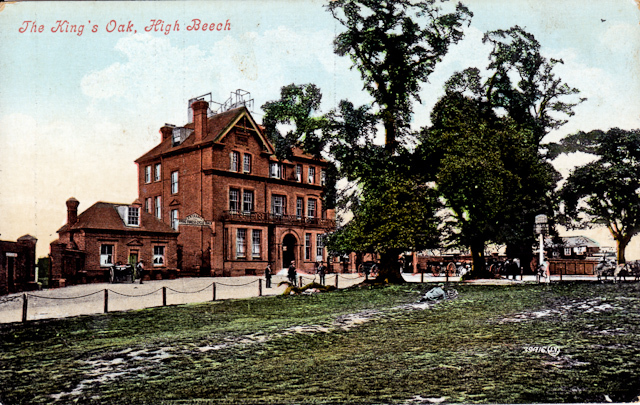 Kings Oak Hotel - High Beech. 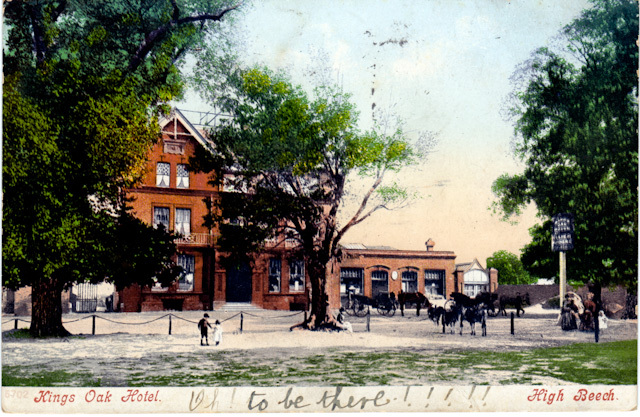 Postcard, post marked June 1904. Addressed to Miss Wigg, Flower Dept, D H Evans & Co, Oxford St, W.
The King's Oak Hotel seems to have been built in 1884. George Louis (Georg Ludwig) Gumprecht was the proprietor from 1887 to 1908. It seems D H Evans of Oxford Street, London is now a part of the House of Fraser. Postcard, post marked 1 June 1909. Addressed to Mrs Yardley, 20 Hertslet Rd, Holloway, London N; probably from Bert. A Valentine's Series postcard. 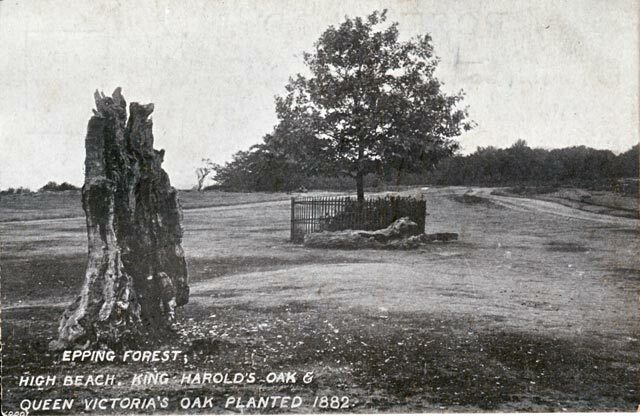 Another postcard of the King's Oak. The sign above the gates reads: Entrance to Epping Forest Cycle Track. Was this a bicycle track that preceded the High Beach Speedway that opened in 1928? 1016. High Beech. Epping Forest. Epping Forest. 3307. View at High Beech.